This is my classic vegan pie crust, a decedent Coconut Himalayan Sea Salt pie crust. Yes, it is as awesome as it sounds. No holiday dessert table should be without it, ever. Now, I will admit that I do have an advantage, when it comes to baking pies with homemade vegan pie crust. I grew up thinking pie was in the breakfast food group. My mom is the pie maker of all pie makers. People know her for her pies. She makes pumpkin pie, lemon meringue, apple and apricot, peach and blackberry (with fresh picked blackberries), chocolate and vanilla pudding pies. Mom makes her crust the good old fashion american way, with Crisco vegetable shortening. But that’s not the vegan pie crust recipe that I am about the share with you. In fact, I couldn’t share it even if I wanted to. There is no recipe for Mom’s pie crust, she just “feels it” when measuring her ingredients. But don’t be disappointed, this Coconut Himalayan Sea Salt pie crust is even better. I mean, equally as good (Hi, Mom) as Mom’s recipe, and here’s why. I recently discovered the secret to a perfect pie crust. All these years, I figured Crisco was the trick to the awesome melty, flakey texture of Mom’s vegan pie crust. Then one day, she made a pie at my house, and the crust ended up a bit tough, and unlike her crust recipe. I own one pie pan. It is a pretty blue Martha Stewart ceramic pie pan. I bought it for the color. I love blue and green. Mom owns two pie pans. They were handed down to her from my Dad’s Mom’s collection, from the early 1900s. There are no markings remaining on either of them, so we can only guess who made them. But they are some kind of tin or metal. Pies made in these pans, bake perfectly every time. I concluded that these vintage pie pans must be the secret that was producing Mom’s perfect pie crust. Until one day (the plot thickens) ……. I baked a pie at a friend’s house using my standard vegan pie crust recipe, but with one minor difference. My friend did not have a pie pan, so we used a tin cake pan instead. Guess what happened? My pie crust tasted like Mom’s. This pie crust had the same soft flakey texture of perfection. Could the secret to a perfect pie crust be that simple? Was my ceramic pie pan sabotaging my pie crust all these years? Maybe not, but this crust recipe definitely fairs better when baked in a tin or metal type pan. So, without further ado, here it is! 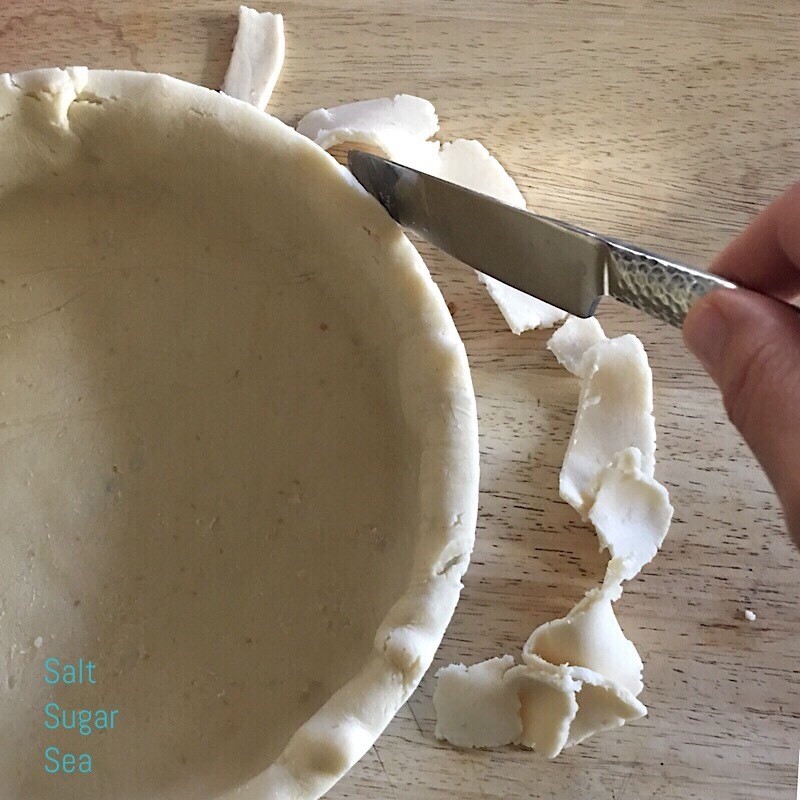 The recipe for one perfect and delicious Coconut Himalayan Sea Salt Vegan pie crust. 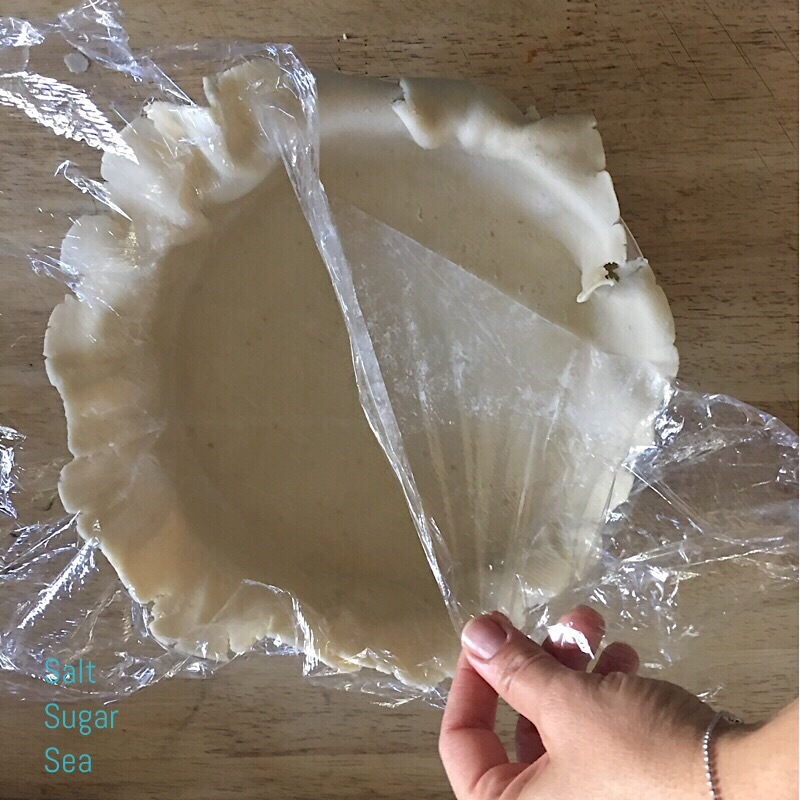 An outrageously good vegan pie crust recipe, made with decedent coconut oil, a spike of Himalayan sea salt, and a sweet crunch of raw sugar. Perfect for sweet, and savory pies alike. 1. Sprinkling a few drops of water on a flat surface, and cover with plastic wrap. 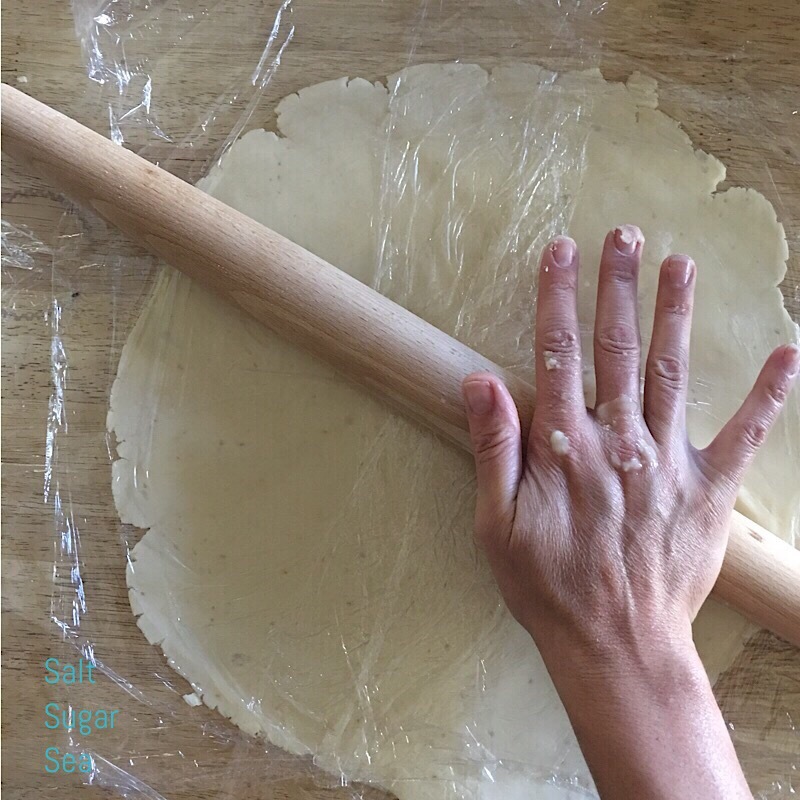 This will keep the plastic from wiggling away when you roll the dough. I hope you love this recipe and come back to visit soon, because there are a couple drool worthy pie recipes coming up that you will want to take a peak at! Thanks so much for following along on the scenic route.